London South Bank University (LSBU) has hosted a delegation of business leaders from the Prince’s Responsible Business Network, as part of the Prince’s Seeing is Believing programme. Seeing is Believing brings together senior business leaders giving them first-hand insight into pressing social and environmental issues. The visit to LSBU was part of a day exploring business leaders’ role in the recruitment, retention and progression of Black, Asian and Minority Ethnic (BAME) talent to the STEM (Science, Technology, Engineering and Maths) sectors. Delegates heard Professor Paul Ivey, Pro-Vice Chancellor for Research and External Engagement at LSBU, discuss how university applicants respond positively to an understanding of the ways in which STEM careers can benefit communities and society. He stated that when phrased in terms of the values that they bring, STEM careers can be made more meaningful to applicants. Delegates also heard from current BAME students at LSBU, who described their passion for their chosen careers, as well as some of the potential difficulties they face given that generally STEM employers have very low numbers of BAME employees currently. Delegates were then invited to consider the business drivers for taking action on diversity in the STEM sector, along with the benefits and opportunities to do more. Beyond examining policies and processes, the visit challenged delegates to consider how the industry can collaborate on securing a more diverse workforce, and how their own organisation can champion the recruitment, retention and progression of BAME talent in the STEM sector. 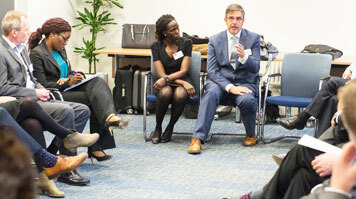 The Prince’s Seeing is Believing programme gives business leaders a unique opportunity to meet extraordinary people, collaborate across sectors and learn from their peers. The programme provides a platform to support leaders in developing practical solutions which inspire change, creating a fairer society and a more sustainable future. LSBU is committed to the provision of equality for all, valuing diversity across all dimensions of difference. The university is also a charter member of Athena SWAN, a national charter mark that measures gender equality in STEM subjects, as well as other academic and professional services disciplines. LSBU is currently preparing its November 2016 submission for the Bronze institution award level of this charter mark.